Papahanaumokuakea Marine National Monument is a protected area encompassing 140,000 square miles (360,000 km2) of ocean waters and ten islands and atolls of the Northwestern Hawaiian Islands. This remote part of the Pacific is relatively pristine and has a large number of endemic species. 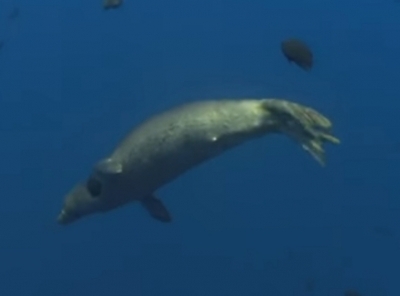 It is also the habitat of the threatened green sea turtle and the endangered Hawaiian monk seal. Culturally, it is important for its centrality to Hawaiian culture and its importance in the settlement of the Pacific. Significant Native Hawaiian cultural sites are found on the islands of Nihoa and Mokumanamana. There are also locations of historic shipwreck sites. The Papahânaumokuâkea Marine National Monument was created by Presidential proclamation on June 15, 2006. I wasn’t sure I had been to this place until I opened up the map on the UNESCO website with a great overview of islands. 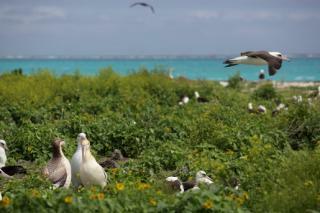 It also all made sense: the Midway Atoll is the only accessible place of the entire monument. This is not Hawaii but instead Unincorporated Territory. Over the years the area has become more and more restricted and I am unsure if there are still tours now. The Battle of Midway tour every June only holds 19 passengers. The cruise liners used to stop here, Carnival was mine back in 2009, but only a handful of people were going on the tender boats due to limited space (and I later found out each tender boat has to be specifically cleaned and equipped for entering the park area which cost a lot of money. The tour group are all under guidance of a local ranger and you cart around in golf carts. The main attractions are the Hawaiian monk seal (yeah we are not in Hawaii but those seals don’t care), birds and WW2 gun emplacements plus old buildings. Unfortunately there is no allowance for scuba diving and the snorkeling limits the view of the underwater life so much. There may be plans for this one day. So all in all the restrictions by the park means I can’t say much about most criteria for its inscription, and even for the species underwater I can’t say much from my own experience. It is for that reason that the better way of understanding of the islands one should head to the Mokupapapa Discovery Center on Hawaii’ (Big Island), either with a day tour or on your own. Tectonic processes: Criterion (viii): The property provides an illustrating example of island hotspot progression, formed as a result of a relatively stationary hotspot and stable tectonic plate movement. Comprising a major portion of the world’s longest and oldest volcanic chain, the scale, distinctness and linearity of the manifestation of these geological processes in Papahānaumokuākea are unrivalled and have shaped our understanding of plate tectonics and hotspots. Dependent territories: It includes the island of Midway which is an "Unorganised unincorporated territory of the US"
Guano 'Mining': "In 1890, Laysan was leased by the Hawaiian Kingdom to the North Pacific Phosphate and Fertilizer Company for a period of 20 years. Guano mining and digging occurred on Laysan from 1892 to 1904. This period saw the construction of several buildings, including a lighthouse and a small railroad, which supported this trade; between 100 and 125 tons of guano could be shipped from Laysan per day" Nomin file. No Buffer Zone: Insc 2010 without buffer zone "The nominated property has no buffer zone, as it is in an extremely remote region and its boundaries have been set at 50 nautical miles (~100km) out over open sea from each of the islands and atolls"....."IUCN considers that the boundaries of the nominated property meet the requirements set out in the Operational Guidelines"